Pregnancy is the period of gestation from the fertilization of an egg, through development of a fetus, and ending at birth. A pregnancy can be multiple gestations, as in the case of twins or triplets. Childbirth usually occurs about 38 weeks after conception, or approximately 40 weeks from the start of the last normal menstrual period. Pregnancy is divided into three trimesters that roughly approximate specific developmental stages. The risk of spontaneous abortion ( miscarriage ) is higher during the first trimester and lessens in the second and third trimesters. The growth and development of the fetus is more easily monitored during the second trimester, while a fetus is generally viable (although it possibly requires medical intervention) in the third trimester. Gravidity (gravid = heavy) is another term for pregnancy as a pregnant woman generally gains a significant amount of weight during gestation. A woman who has never been pregnant is a nulligravida; a woman who is pregnant for the first time is a primigravida; and a woman in subsequent pregnancies is a multigravida. gravidity: Another term for pregnancy. conceptus: The prenatal, developing offspring and its associated membranes. prenatal: During pregnancy, before birth. gestation: The carrying of an embryo or fetus inside female viviparous (having live births) animals, including humans. trimester: A period of approximately three months. miscarriage: The spontaneous natural termination of a pregnancy that expels a fetus from the womb before term. Pregnancy is the state of fertilization and development for one or more offspring within a woman’s uterus. 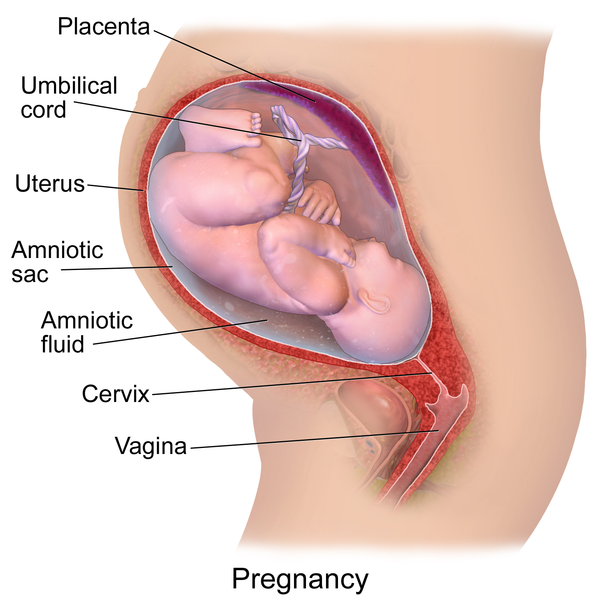 The prenatal offspring (also called the conceptus ) is referred to as an embryo or fetus. The term embryo is used primarily for developing humans up to eight weeks after fertilization (to the 10th week of gestation). After that, the term fetus is used. Pregnancy: Drawing of the lateral (side) view of a pregnant woman’s abdomen revealing the developing fetus. In a pregnancy, there can be multiple gestations, as in the case of twins or triplets. Childbirth usually occurs about 38 weeks after conception. In women who have a menstrual-cycle length of four weeks, this is approximately 40 weeks from the start of their last normal menstrual period. In many societies’ medical or legal definitions, human pregnancy is somewhat arbitrarily divided into three trimester periods as a means to simplify reference to the different stages of prenatal development. The first trimester carries the highest risk of miscarriage (natural death of embryo or fetus). During the second trimester, the development of the fetus is more easily monitored. The beginning of the third trimester often approximates the point of viability, or the ability of the fetus to survive, with or without medical help, outside of the uterus. The Carnegie stages is a standardized system of 23 stages used to provide a unified description of the developmental maturation of the vertebrate embryo. This system bases stages on the development of structures instead of days of development or the size of the conceptus. This staging method is used only for the first 56 days in humans (prior to the fetal period). 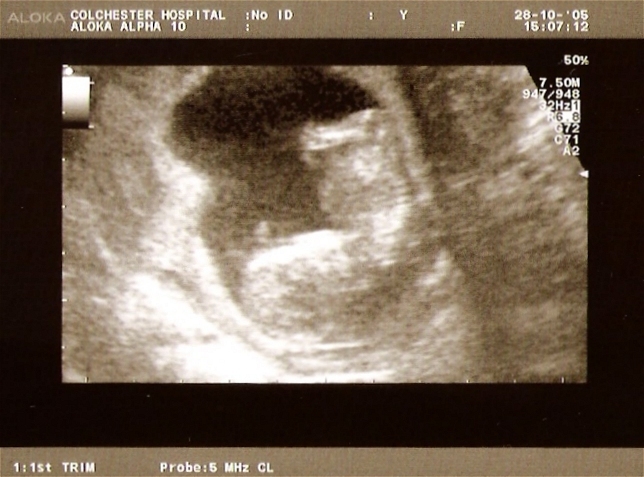 Ultrasound scan: Ultrasound is used to monitor the age and health of the fetus during pregnancy. One scientific term for the state of pregnancy is gravidity, which is Latin for heavy. A pregnant female is sometimes referred to as a gravida. Similarly, the term parity (abbreviated as para) is used for the number of times a female has given birth; parity counts twins and other multiple births as one pregnancy. Medically, a woman who has never been pregnant is referred to as a nulligravida, and a woman in subsequent pregnancies is referred to as a multigravida. A woman who has had more than one live birth is referred to as multiparous, and a woman who has never given birth is referred to as nulliparous. During a second pregnancy, a woman would be described as gravida 2, para 1 and, upon live delivery, as gravida 2, para 2. An in-progress pregnancy, as well as abortions, miscarriages, or stillbirths, account for parity values being less than the gravida number. In the case of twins, triplets, and so on, the gravida number and parity value are increased by one only.